Now that I’m officially several weeks into my life on Dexcom, I just wanted to scribble down some notes for the purpose of keeping a record on how it’s been going so far. This is mostly stream of consciousness, but as usual, my stream of consciousness still contains several words. Hopefully, they are ones you’ll want to read. Here are eight observations on the early going with Dexcom. 1. I know that I have FDA approval to bolus based on my Dexcom G5 readings, but I haven’t done it yet. Okay, I may have pushed a one unit correction bolus through once or twice without doing a fingerstick, but that’s all. I’m not blousing for a meal based on my display. I’m confident in my Dexcom– I’m just not confident that it will be perfect 100 percent of the time, every single day. I would hate to over- or under-bolus based on the one time it’s off by a bit. I hate to think of the result of doing that. So, no dice to the bolus-off-Dex so far. 2. I’ve got to remember to order some Skin Tac or Opsite Flexfix or something to hold down my sensor, and soon. The peeling is real, folks. 3. At the Diabetes UnConference, I checked in with a couple of people to get their pointers on doing an upper arm insertion. I also looked at Daniele Hargenrader’s recent video showing her doing this. Then I did it. Then I loved it. It’s mostly out of the way, and the sensor works pretty good there. And the accuracy has been fantastic. Win-win-win. 4. I’m not interested in using my thigh or forearm for sensor placement. I use my thigh a lot for insulin pump infusion sites, and I’m guessing that using my forearm would be painful. This outlook is subject to change, as I should be from time to time. Also, I may be going back to using my midsection for a while anyway. More about that at another time. 5. Based on what I’m seeing up to now, it looks like the basal rate settings on my insulin pump are, frankly, stellar. Whether I’m high or low (you’re welcome Janelle Monae), once the peaks level out, if I don’t touch my pump, the line on my graph is pretty flat. I’m a little shocked, but happy that my endocrinologist and I were able to work this out without the benefit of a CGM to guide us. 6. 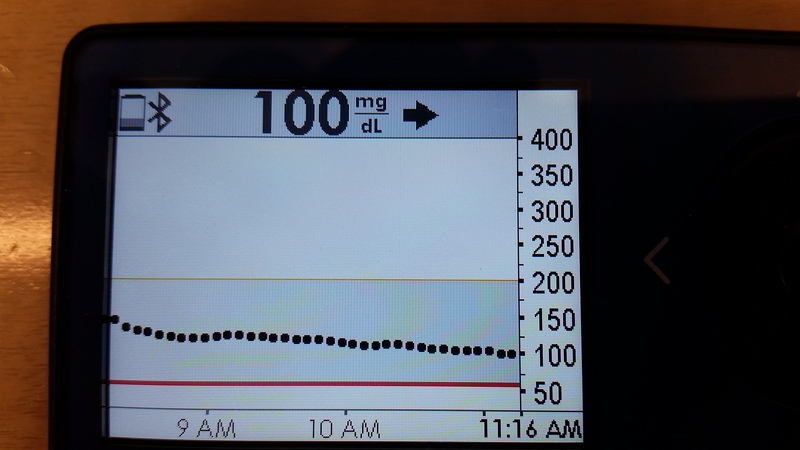 I have avoided the newbie temptation to check my CGM graph every two minutes. 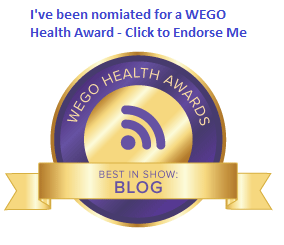 I think that’s because of my Dexcom experience during clinical trials. Of course, not checking the receiver all the time means I’ve made the mistake of putting it on the table and walking out of the room every so often. I never said I was perfect. 7. That said, can I just say how much I really hate the fact that I still have to look at a pager-sized display to get my readings? I’m not buying the “We’re working on an Android solution” anymore. You’re not… just admit it. If I’m wrong about that, I’ll be the happiest guy around who ever had to eat his own words, and I will gladly eat those words in this very space. 8. Like anything, when things go well, you tend to see something in a very positive light. That’s where I am now. At the beginning, I had a failed transmitter which also cost me a few sensors, and that was extremely frustrating. I realize that how I use my CGM, and how I react to various things affecting my use of my CGM, may very well change over time. But I hope things remain positive. Because for the last couple of weeks, it hasn’t been a big problem to deal with, and that’s the only way I’m going to buy into the notion of wearing my Dexcom every single day. Those are my initial observations. I wonder how I will feel about my CGM in a year? Only time will tell. The goal is to make it to another year and find out. I am so with you on #7! I feel bad for the reps who have to look us in the eye and say Android is coming for the third (at least) year in a row. I’ve given up but love everything else about my dexcom… Daughter uses ipod touch so that works.